Sims are stupid. When putting down an object, they'll tend to place it on the nearest surface that they can reach that is compatible with this particular type of object. This tends to result in Sims putting a lot of objects that they no longer are using on dining tables. Almost anything a Sim will place on a table autonomously (and most of the things you might want to put on a table) will interfere with eating, and finding out what won't interfere by trial and error is tedious. 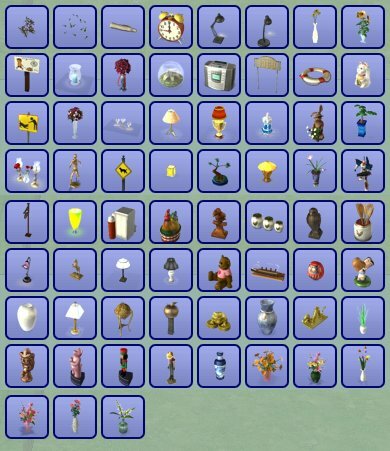 So I did it once, and put everything from The Sims 2, University, Nightlife, Open for Business, Pets, Seasons, Bon Voyage, the 2005 Holiday Pack, Family Fun Stuff, Glamour Life Stuff, Celebration Stuff, and H&M Stuff that works as a Table Centerpiece in this collection. As you can see above, there's some surprising stuff in here. Also includes the OFB craftable flowers. Two versions are provided. The Pre-Pets version contains two separate collections; one for Residential Lots and one for Community Lots. This version should be used if you don't have Pets, or any Expansion or Stuff Pack that came later. This version can still be used if you do, but the Post-Pets version's preferred. The Post-Pets version should be used if you have The Sims 2 Pets, or any Expansion or Stuff Pack released later, including Seasons, Bon Voyage, Celebration Stuff, or H&M Stuff. If you don't have a Post-Pets expansion or Stuff Pack, use the Pre-Pets version. Updated: The Post-Pets Collection now includes objects from Free Time, Teen Style Stuff, and Kitchen & Bath Stuff. I could have updated the Pre-Pets version to contain them, but there would be little point. Post-Bon Voyage, most of the OFB craftable flowers are only placeable on Residential lots, due to changes in the way collections work.